If we were inside a purist problem solving expert’s mind, maybe we should consider “the fact we have to select a problem solving methodology every time we face a problem” as a recurrent problem itself, and thus, resolve it by selecting a methodology. What a vicious circle! More seriously, why do we have such a range of choice? Why experts, companies, engineers or whoever the designer was, created a methodology (a problem solving tool) different from the previous one, created by another “whoeverhewas”? Is there a real difference between one or the other? Let’s focus first on the different methodologies. The non-exhaustive list of the most known ones is: the PDCA (Plan Do Check Act), the 8D (8 Do), the 9S (9 Steps) and the DMAIC (Define, Measure, Analyze, Implement, Control). The PDCA comes from the Deming’s work and was initially designed for the continuous improvement. The concept is simple but efficient: follow 4 steps to ensure the idea you have will be properly implemented and durable. You have to plan (P) what you want to do, to implement it (D for do) according to the plan, to check (C) the efficiency of the idea and to act (A) that this is the new standard. The 8D, initially used by the US army and seized by Ford, is commonly considered as an automotive methodology. That’s the first one introducing the concept of root causes analysis, but many experts name it “the 8-steps PDCA”. The 9S is really similar to the 8D with a stronger focus on immediate countermeasures to protect customers. The origin of the DMAIC problem solving approach is the Six Sigma world. 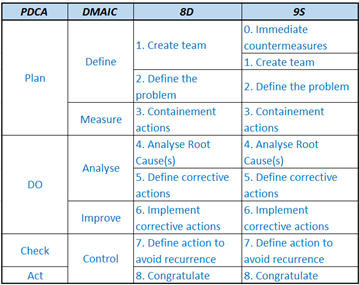 Once again, expert are used to name it the “5-steps PDCA”. This methodology is often related with statistic tools, even if adapted to other kind of problem. It’s nowadays fully integrated in the “Lean 6 sigma”, an approach which take the best of the 6 Sigma and the Toyota Productive System. Some companies have even designed their own problem solving approach. One of them, created by a French aircraft manufacturer, is called the PPS (Practical Problem Solving) and aims to solve small shop floor problems. And it’s basically a mix of the different tools and steps proposed by the other problem solving methodology! Industrial entities usually sort these tools by complexity of problem to tackle: from the 9S/8D for complex problems to the PDCA for simpler ones. To sum up, whatever the approach, they all follow a similar methodic way to solve a problem. The question is: do we have the knowledge of this primary methodic philosophy? Don’t we use these methodologies in the same way that most companies use the lean approach? I mean, don’t we use these methodologies in a non-appropriate way: the initial lean philosophy, a production machine should always keep an extra capacity, but we use the lean approach to find ways to load machines up to 100%! The challenge of today regarding problem solving is maybe to come back to the fundamental philosophy of all these methods to understand the real meaning of each steps, get rid of too complex formalism and be able to treat complex problem and “just do it” ones in the same way.